Transforming Faces has been working hard to secure a place at school for Yeabsra, so that she is able to interact with other children while she waits for her next surgery. Proper stimulation and social interaction are extremely important as part of her overall treatment. Unfortunately, her visitor status in Canada prevents her from attending her local public school. However, MPS Etobicoke School has opened their doors and have welcomed Yeabsra with open arms. 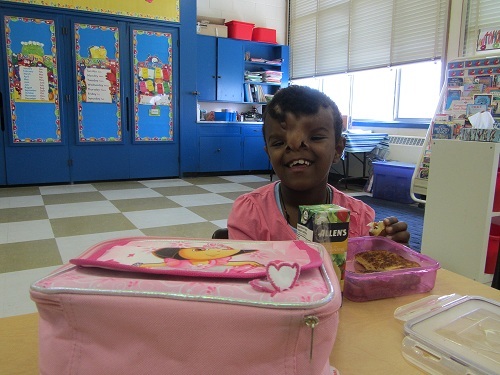 She attended school this past week and judging by her smile, she is loving every moment of it! MPS Etobicoke School is also located close to Aynalem’s congregation, which will allow Aynalem to be closer to her community. This is great news and we are grateful to MPS for their dedication to our cause! Check out this wonderful story about Yeabsra’s first day, written by the Toronto Star’s Leslie Scrivener.